Dr. Steve Yetiv (1964-2018) was the Louis I. Jaffe Professor of International Relations at Old Dominion University (ODU). 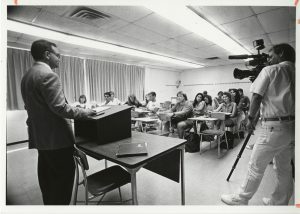 Dr. Yetiv taught at ODU from 1993 until his death in 2018. He received his Bachelor and Master of Arts in Political Science from the University of Akron in 1985 and 1987, respectively, and his Ph.D. in Political Science from Kent State University in 1990. Prior to coming to ODU, Dr. Yetiv was a Post-Doctoral Fellow at Harvard University. In addition to teaching courses in the Department of Political Science and Geography, Dr. Yetiv authored or co-authored several books including “Myths of the Oil Boom: American National Security in the Global Energy Market” and “Challenged Hegemony: The United States, China and Russia in the Persian Gulf.” An expert in the politics of oil production, he was also the author of articles and was featured on CNN, CNBC, CSPAN, and NPR. Dr. Yetiv won several awards including Harvard University awards for excellence in teaching (1992 and 1993), the Virginia Social Science Assoication’s Scholar Award (1999), ODU research and teaching awards, as well as the State Council of Higher Education for Virginia Award Outstanding Faculty Award (2012). Cawley, Jon, “Steve Yetiv, an Internationally-Recognized Expert in the Geo-Politics of Oil, Has Died at 53,” Old Dominion University, accessed 25 April 2018, https://www.odu.edu/news/2018/3/steve_yetiv#.WuDVNfkvypp.